I was in the middle of making chocolate frosting for cupcakes, then changed my mind and decided I wanted chocolate cookies instead. Since I’d already mixed together the butter, confectioners’ sugar and cocoa powder, I had to build the rest of the recipe around those ingredients. Great results! The cornstarch in the confectioners’ sugar helped give the cookies a wrinkly, cracked look which I really liked, and the texture was good — chewy, dense and soft. 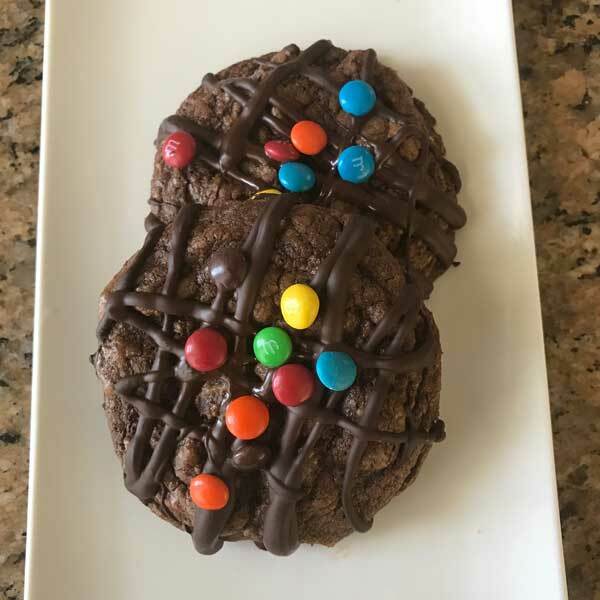 You can leave the cookies as is, or jazz them up a bit with a drizzle of chocolate plus some M&Ms. Tip: The dough is pretty stiff, so it helps to use a stand mixer. Also, the recipe halves well should you only need 12 jumbo size cookies. 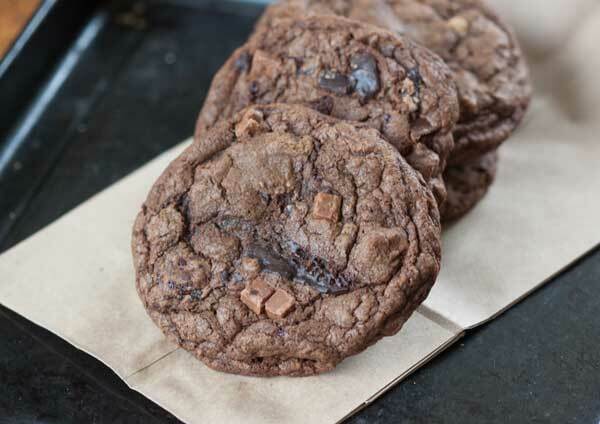 Crinkly, double chocolate cookies made with a mixture of confectioners' sugar and brown sugar. In a large mixing bowl, beat the butter until creamy. Add the confectioners’ sugar gradually and beat until smooth, scraping sides of the bowl, then add the brown sugar, cocoa powder and extracts and beat until smooth. Add the eggs and stir or mix on low until they are mixed in, then beat on high until light and fluffy (about a minute). Sprinkle the baking soda and salt into the batter and then beat until thoroughly blended. Add the flour and stir, do not beat, until blended. Stir in the chocolate. Dough will be thick and heavy. Scrape it out onto a large sheet of wax or parchment paper and then form into a lump. Divide lump into 24 or 32 equal size pieces. Wrap pieces in wax paper and chill until ready to bake or bake immediately. Put mounds of dough on a heavy duty baking sheet lined with parchment paper. Allow about 3 inches of space for spreading. Bake at 325 degrees F. for about 15 to18 minutes. Cookies should puff up and will fall a bit as they cool. Allow them to cool for about five minutes on the baking sheet, then transfer to a wire rack and let cool completely. Oh No, Not Another Double Chocolate Cookie! Those look good and the m&m’s are kind of festive. It is amazing that you could switch mid-stream like that and have delicious results to boot!!! Oh Anna! You always make me so hungry! Definitely pinning these to try later. My top taste tester is on a diet, getting ready for a body building competition in a few weeks. Can’t wait until he is done and I can make him these. He has already requested cookies and homemade bread as soon as he is done.